The awesome ladies over at Graveyard Shift Sisters have a fun contest going on this month. They are challenging horror fans to choose their favorite black women in horror. Besides my greed for free horror movies, I like this opportunity to review my horror history and find positive examples of black female characters. 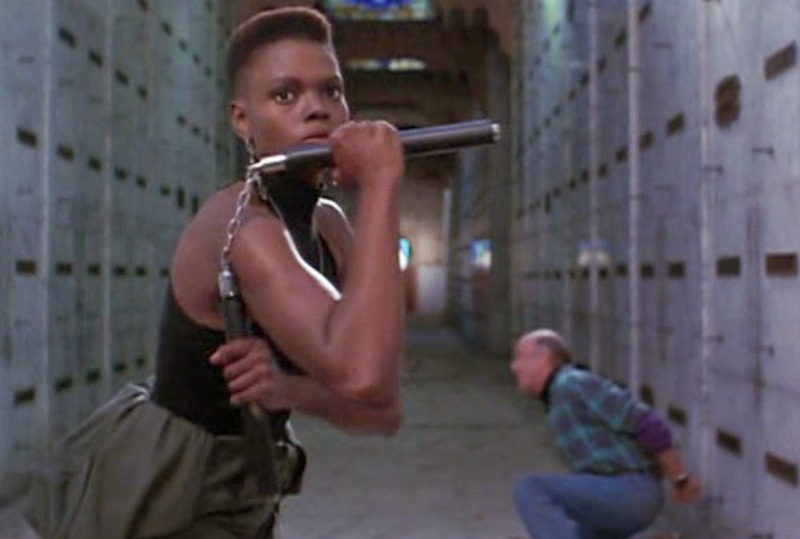 With that in mind, my choice for my favorite woman in horror is Rocky from Phantasm III. Now, please don't let my obscure choice of a low-budget sequel from an already low-budget franchise serve as a dismissal of other great black women in much better movies. The Phantasm series has always been near and dear to my heart, and I love every entry in the series for all of its cheesy, illogical glory. For those unfamiliar with the Phantasm series, here is the short, short version: a creature from another dimension named the Tall Man is harvesting dead bodies to turn into slaves in his world, and a group of guys, including a boy, his brother, and an ice cream man are the only ones who can stop him. No, I'm not kidding. Now, one thing about the Phantasm series is that it's admittedly very Caucasian. White director, white actors/actresses, etc. Reggie: Come on, Rocky. Haven't you ever tried vanilla? Now, given that Rocky, a black woman, was written by Don Coscarelli, a very white man, Rocky could have easily slipped into a caricature. Fortunately, Coscarelli knew to to listen to actress Gloria Lynn-Henry when she had notes about her character. "Being a black female, I know there's certain dialogue that she just wouldn't say," explains Lynn-Henry in an interview given to Dustin McNeill for his book Phantasm Exhumed. "Don was so wonderful in letting me add a couple of slang things here and there, and letting me reword my lines. It made me feel so much more comfortable with the character." Unfortunately, while Rocky survives Phantasm III, she doesn't return for Phantasm IV. She did get get to ride off into the sunset, however, so if we're lucky she'll return for the upcoming Phantasm V: Ravager. The series needs its asskicker back.